Bullet Journaling, or ‘BuJo’ if you may, is not a new concept. It has been around for a number of years but was brought to prominence by Ryder Carroll, a Brooklyn-based product designer, gaining precedence as it unfolded within the art communities on social media platforms such as Instagram and Pinterest. For the uninitiated, BuJo revolves around the idea of keeping a journal but progresses with elements like indexes, logs, planners and to-do lists. This, in essence, helps you organise but, at the same time, can also help you unwind. Bullet journaling is progressively being used as a form of planning and tracking daily to monthly events, tasks, personal habits, negligible financials and other aspects of a person’s life that usually take a backseat in the larger scheme of things. Usually these notebooks are sturdy and can have patterns, like grids or dots, and are accompanied by doodles based on a theme. With more details on the inside, the journal leads to pages that are divided into daily sections holding empty boxes with a room for assigning tasks. There are no hard and fast rules when it comes to maintaining this journal—assign a task, tick off once done, add an arrow to postpone, or cross it off to cancel—for the end goal of this exercise is to have a therapeutic experience while organising many aspects of your life into one small notebook. In the Nepali art community, there are bullet journaling enthusiasts who are passionate about this craft. To reach out to a wider audience, they share their work on social media platforms. The Post reached out to a few remarkable ones on Instagram, to learn about their experience, their motive behind it, and to sneak out some tips for newbies! One could well keep a regular journal and still enjoy the therapeutic benefits, so why take the trouble of managing a bullet journal? The answer is the plus point of having the liberty of doodling without looking silly. And, for people who are good at multi-tasking, a daily dose of doodling on their bullet journal can be rewarding. Therapies can be time consuming but if bullet journaling is the medium of your choice then about 10 minutes on the clock should bring you the results. For some, even a few minutes work wonders. Anyone with innumerable tasks to accomplish within a limited time frame tends to plan their days in advance but bullet journaling is more than just that, it lubricates the creative engines of your mind as it requires practice to fill the pages alongside sticking to your plans. This craft comes with the freedom for a creator to choose their own way of using their journal. Bullet journals can be decorated with monthly or weekly themes depending on the individual’s preference. Aside from doodling, adding stickers or images along a theme can not only add a visual appeal but can also get your creative juices flowing. And, even if the rules are broken, it’s alright—it’s your own planner anyway. “I see many people who stick to a single theme for a whole month, but I find that a tad bit boring so I come up with something new every week,” says Sneha. Art is all about experimenting with mediums to let artists express themselves. 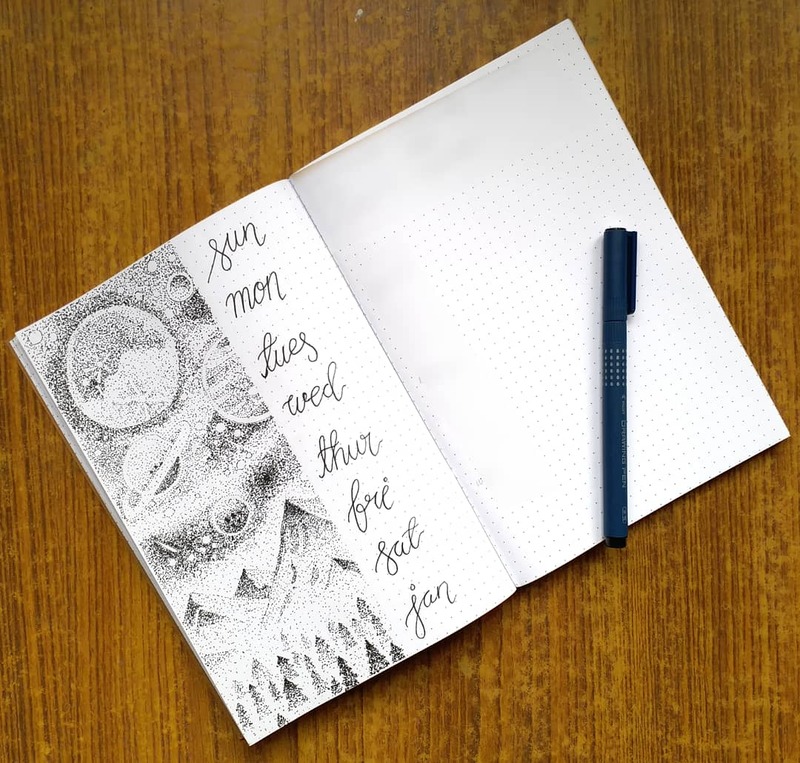 While bullet journaling helps one manage their schedule and be more productive with their daily routines, it provides a room to experiment with art within the open pages of a notebook. “I like to play with doodles and colours in my journal which feeds my creative soul and they are really important to me,” says Kajina. 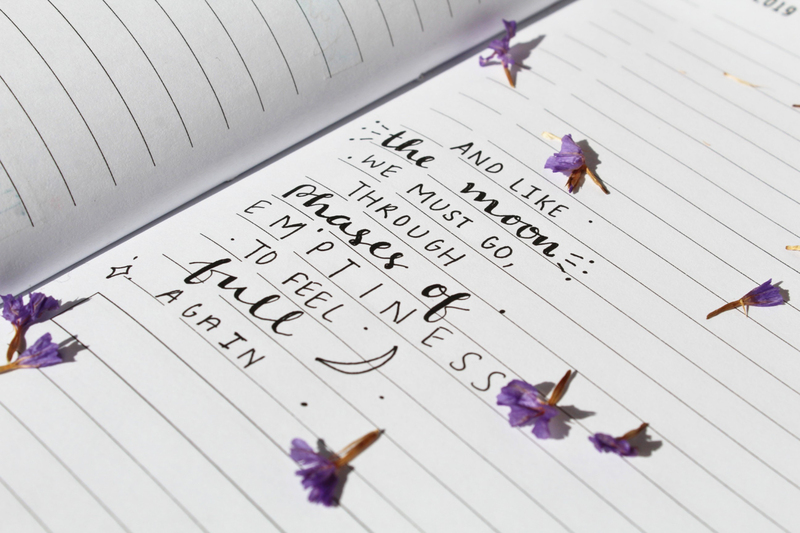 A bullet journal can encourage and create a personal space for one’s self-growth. “I initially doodled devoid of anyone’s judgment or criticism, and even though you can’t avoid that forever, it really was a good start,” adds Rubina. If you’re familiar with using planners, maintaining bullet journals shouldn’t be a mammoth task. One can add or make their own pages depending upon their requirements of tracking and planning things. “Bullet journaling helps me to stay organised and productive,” says Kajina. Being productive doesn’t always have to be determined by checks in task squares. For someone to be able to make more out of their day, following their plans and trying to keeping up with them is also a progress. “I like to be flexible with my plans and go with the flow. I try to complete as many planned tasks as I can for the day but in case it doesn’t work out I move the task for another day,” says Kajina. The whole process of creating pretty journals can be overwhelming but at the end of the day, a bullet journal is something you can check to figure out how effectively you’ve spent your day. “Since I started on Instagram , I had a hard time keeping up with people’s expectation. Now, I don’t really fuss over my journal as long as I’m productive. This has so far been a great experience and I don’t plan on stopping any time soon!” says Rubina. Anticipating the things to do is one side of the bullet journaling coin, the other side is a whole different story—it gives you the chance to walk down your memory lane while tracking your progress and productivity. Rubina says, “Journaling at its core is personal with memories attached to every little thing you jot down.” Alongside acting as a medium to track one’s habits, expenses and such, it allows the creator to reflect on the headway she or he has made since starting the exercise. “Journaling has really helped me reflect on myself. Besides the daily to-dos, I also include habit trackers in my journal which has helped me understand my habits better,” says Kajina. One can even make a decorative page containing lists of activities one wants to do later. “You can add whatever pages you want catering to your personal interests, for example, a page dedicated to movies to watch or books to read so you don’t have to spend time on deciding what to watch or read later,” says Sneha. Additionally, it acts as a reminder for all the important dates (birthdays, anniversaries, appointments, or any other special events) you may otherwise have missed. “It’s a great way to remember your friends’ birthdays!” adds Rubina. Kajina, Rubina and Sneha, all agree on one of the salient points of maintaining a bullet journal—don’t make it complicated. One takes up this exercise to increase one’s productivity and to make life easier, therefore, complicating things is the a no-no. The addition of themes and designs is add-ons and depends upon the creator’s choice to have them included, or not. “Just get started and find the best method that works for you, aesthetics come later. You will know what works for you once you start experimenting, so the first thing is to jump on the bandwagon of bullet journaling,” says Kajina.